The serious study of diversity and multiculturalism is precisely what the world needs at this critical juncture. I do not believe that we will ever approach the goal of human security until we are able to come to terms with our feelings of hatred, fear and apathy of our differences. If we were to spend but a tiny fraction of the resources poured into waging wars to promoting and appreciating how our differences work in our favour, rather than against it, the world would be an infinitely safer and more prosperous place. Diversity is not only to be cherished; it is essential. I know this as an educationist for the store of knowledge does not increase until and unless there are differences in thinking. It is when there is stultifying uniformity that stagnation occurs. I know this as a Muslim for Islam recognises other religions. Islam itself is built on a history of myriad traditions. I know this as a Malaysian for what has built this country and made it strong are the contributions of its different communities. Malaysians of different races and religions have come together to put their shoulders to the collective plough despite their differences, something that many countries have not been so fortunate enough to share. For the full text of Raja Nazrin's speech, go here. All these Royalty seem to be saying one thing and doing another. The most baffling are their approval of the new CJ, that peculiar statement/warning on questioning Malay rights and a non-existent Social Contract and now utter silence over the Sharia proposal by the CJ and Civil Law judges and AG to merge the two Constitutionally Protected Legal Systems. How on earth can Sharia Laws which embraces hudud, lopping of limbs, amputation etc ever be accepted by non-Muslims? What gives and who can we really trust? Put yourself in their place, DPP. It's a snaky line between resigning yourself to a whole lifetime as "window dressing" - and being fully human and therefore free to sometimes say & do silly things. Life in the palace isn't everybody's cup of tea (certainly not mine) and those of "royal" blood (like Raja Petra) who refuse toe the line have to put up with being charged on all sorts of idiotic grounds and suffer being ISA'ed by Umno's potatohead gestapomen! Raja Nazrin has somehow managed to find a good balance between being a gentlemanly, rakyat-conscious monarch-to-be and playing his traditional role as an overdecorated patong of Malay parochialism. but alas , we really dun need peope like him. Talk only but no action. This is not a "policy" speech but an opener and pace setterfor the forum. In the second para this blogger highlighted, it is meant to encourage diversity in discussion. This speech is very consistent with the Sultan Perak's speech on receiving the show of support at his Kuala Kangsar istana. He asked where do you draw the line between multiculturalism and the need for oneness. 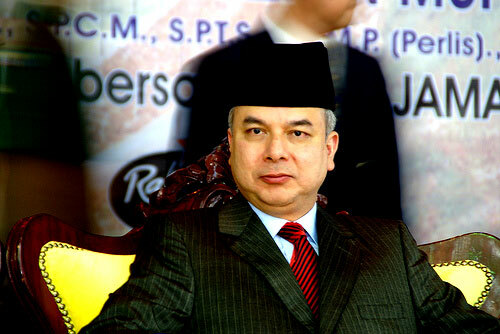 He covered one approach that of integration, which is already in practice in Malaysia. Why then are non Malays/Bumipetra unwilling to integrate into the major majority, but remain segregated within their vernacular schools, race-based political party (but spinning as multiracial, oh what a lie! ), working within their racial community, refuse to acknowledge (through practise and acquiring teh competency) Bahasa Melayu, constantly refuting Islam (manipulating to silence the Article 11(3) and 11(4)), struggling for their selfish race agenda (but lying as though it is a national agenda but collectively they are only concern of their own). etc etc etc. Who is against integration? Is it not non Bumi??!!! We could have build a great nation if not for the recalcitrant and xenophobic racism of the immigrants! Do read Comber on race relation before attempting to reply. Well... since November 2008 (when this was posted), the entire Perak royal house (at least, this particular branch of it) has had to eat its own high-sounding words... after its shameful role in the disgusting Perak power grab of February 2009. IS THIS THE END OF UMNO?